A quick heads-up that on Sunday, June 24th, Endeavor returns to MPT. 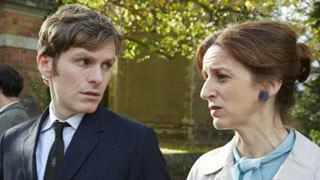 This will be Season Five of the series, which stars Shaun Evans, as a young Inspector Morse. The original Inspector Morse was, of course, played by John Thaw, who sadly died from cancer of the esophagus at the age of 60 in 2002. Ten years after the actor’s death, his daughter, Abigail Thaw, reportedly jumped at the chance to appear in the first series of Endeavour, playing newspaper editor Dorothea Frazil. That character’s name, by the way, is supposedly a ‘nod’ to Thaw’s father. According to the dictionary, ‘frazil’ is “soft or amorphous ice formed by the accumulation of ice crystals in water that is too turbulent to freeze solid”; in other words, a sort of “slushy ice”. So “D” “Ice” would in other words be “thaw”, as in John Thaw! The creator of Endeavour, Russell Lewis, who has written each and every one of the episodes since the series first aired in 2012, often includes references to things other than the main mystery at hand. In series three, for instance, he marked the death of director Mike Nichols by penning a scene in which a lady called Mrs. Richardson attempts to seduce Morse. The scene was almost identical to the one in the Nichols directed film, The Graduate in which Mrs. Robinson attempted to seduce Benjamin. "The Graduate" was also the title which Lewis gave to the episode he wrote. Another re-occurring ‘puzzle’ in Endeavour is the mystery of DCI Thursday’s Wednesday sandwiches. Every weekday, Fred’s wife Win, sends him off to work with a sandwich and over the course of the last four series we’ve discovered what sandwiches she packs and on what days. On Mondays it’s cheese and pickle, Tuesdays luncheon meat, Thursdays ham and tomato, and Fridays corned beef. But the contents of Thursday’s Wednesday sandwich remain a mystery! 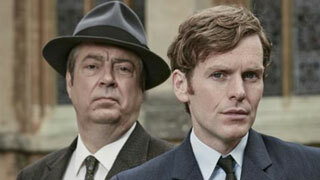 Maybe we’ll find out in Season Five of Endeavour. Endeavour Season Five airs Sunday, June 24th at 9pm.